Sandy Denny ‘s time with Fairport Convention only lasted a scant four years in total, and yet you will always associate this band, which has now been going relatively continuously for 46 years, with her name. After the commercial failure of Fotheringay (a band she started in 1970 after leaving the Fairports) and a solo career that had resulted in some well received, but poor selling albums, Sandy reunited with Fairport Convention in 1974 for a second two year stint (bringing half the line-up of Fotheringay with her). Both she and the band had great expectations for “Rising For The Moon” (produced by the legendary Glyn Johns ) – their first not to include traditional material, but rather 11 band originals, Sandy being responsible for five of them. It should have been the start of a new golden era. 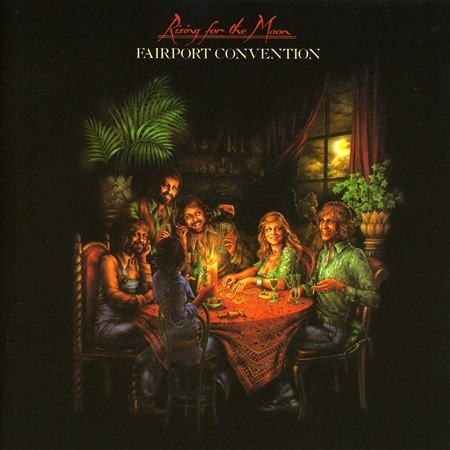 However, the record buyers ignored the album, and this incarnation of Fairport Convention disintegrated as 1975 drew to a close. It is tragic when you hear how strong the best tracks are. Sandy delivers some of her finest compositions. The divine epic “One More Chance” is the icing on the cake. Eight painfully beautiful minutes where Sandy, her voice like frozen breath on a windowpane, takes you through a wintery landscape of naked trees and loneliness, before she steps aside leaving center stage for Jerry Donahue who’s redeeming guitar solo brings the song to its mighty, cascading conclusion, Sandy re-entering, hitting the high notes as the guitar bursts into flames. Simply stunning. A little lighter and very easy on the ear is the spooky title track, again sung by that voice. Vulnerable, but proud, soft, but with an edge. Highly remarkable and always moving. The sound of an angel. The album’s failure is still a mystery to me. People’s hearts must have been made of leather. I am also convinced that if this had been the success the band hoped for, Sandy Denny would still be among us. Instead her private life gradually imploded in an unworthy descending spiral of alcoholism, drugs and self-destruction. It’s such a horrible shame. Buy the record, listen close and experience how the most beautiful and lonely voice of rock music breathes life into every word it touches. Sandy was the greatest female singer Britain ever produced. If you want more, do a YouTube search for “Who Knows Where The Time Goes” with Fairprort Convention – and weep.